Choose Form 4 to add spoken/written mother tongue. Choose Form 5 to video hand signs. Drag to left to advance through form. It may be helpful to read the ReadMeFirst form 1st. 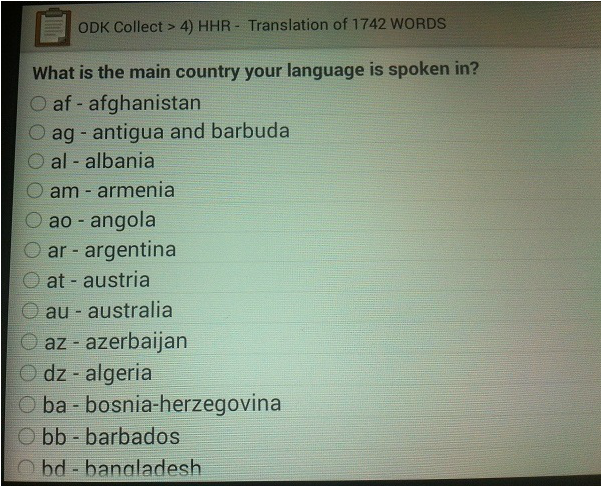 Choose the country where your mother tongue is most spoken. You will find Swahili under Tanzania, not Kenya. In this example... 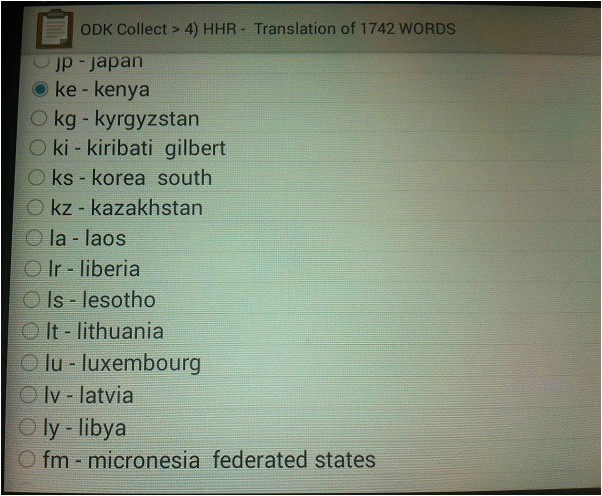 Since we chose Kenya... the list shows the languages of the world that are most spoken in Kenya. 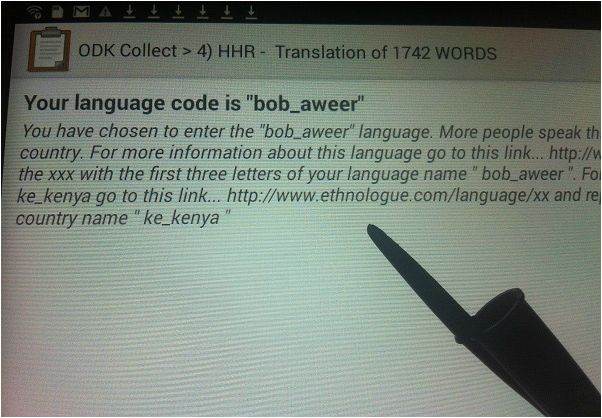 I chose bob_aweer beause I like that 3 letter language ID. 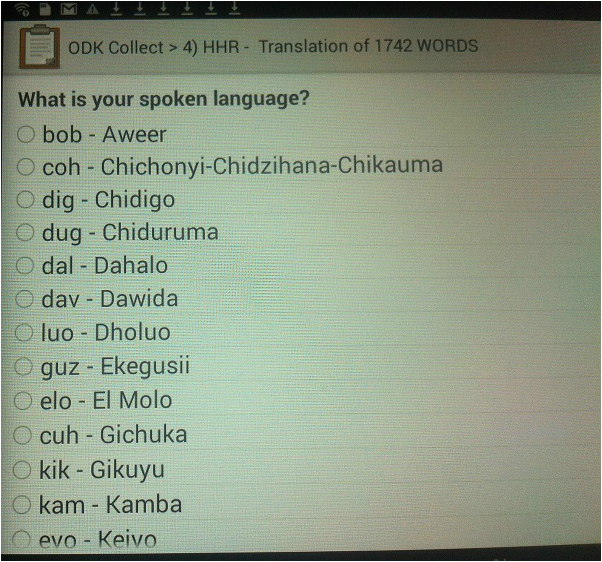 :-) If you can't find your language you can google search "ethnologue Kenya" and look through all the languages of Kenya to find it. 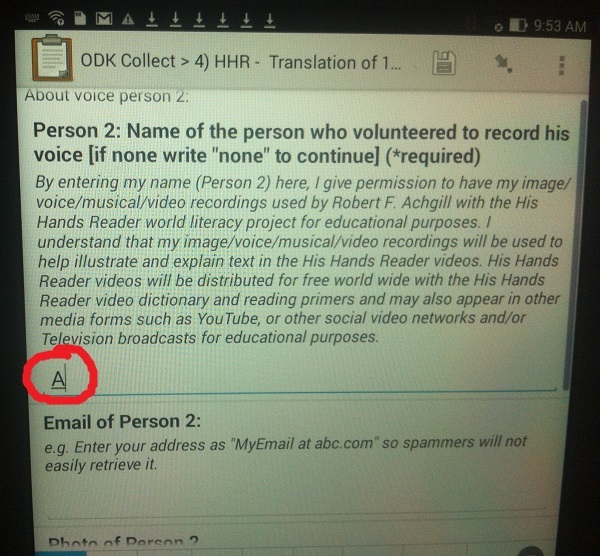 The next few screens are where you enter information about volunteers: name, email, photo and say "Yes" if it is OK if His Hands Reader can acknowledge in public that you participated on the project. Some people may be shy and want to say "No". All the screens that enter information about volunteers must have something in the Name field before you can pass to the next screen. 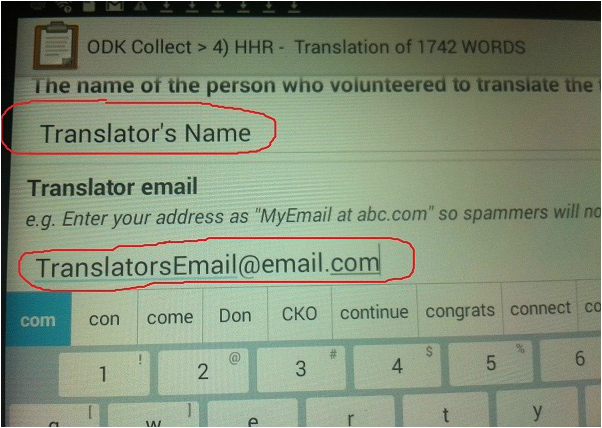 If there is no second volunteer recording voice then just put an "A" in that name field. Always enter your words even if it is the same word for all meanings of the English word. Here you can see that Chinese has a different word for About2 than About1. Choose the most simple words from your mother tongue... not the college level words that describe the meaning. If it takes two or more words then separate them with a "_". 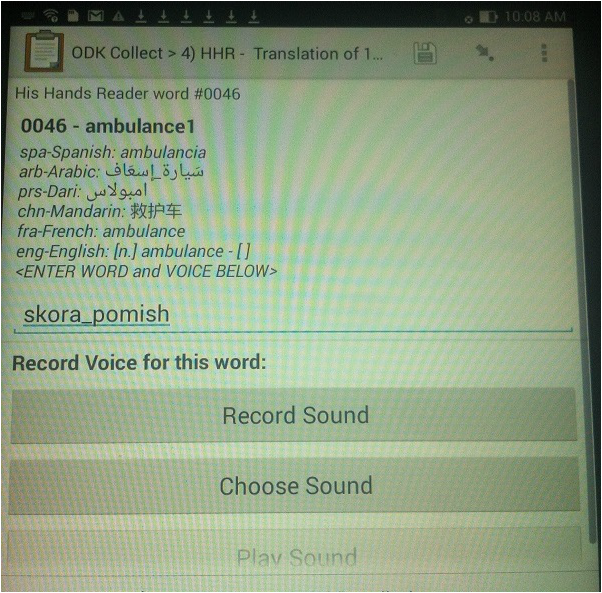 For example: Russian language uses two words to say ambulance -- "skora_pomish" or "quick_help". 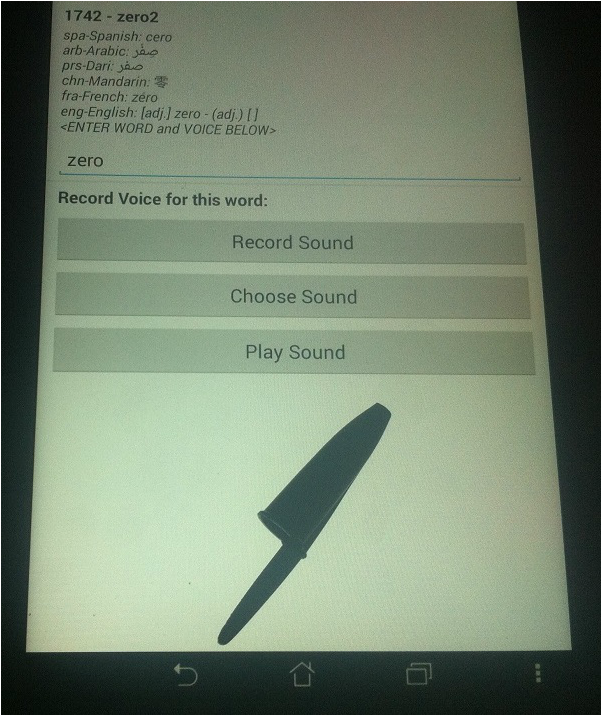 Please use the script that is common for your language. For example... I should have typed "skora_pomish" in Cyrillic script. 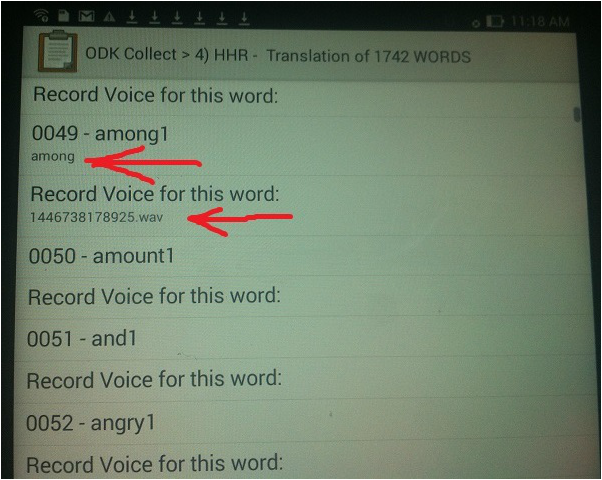 Record your voice saying the word(s). 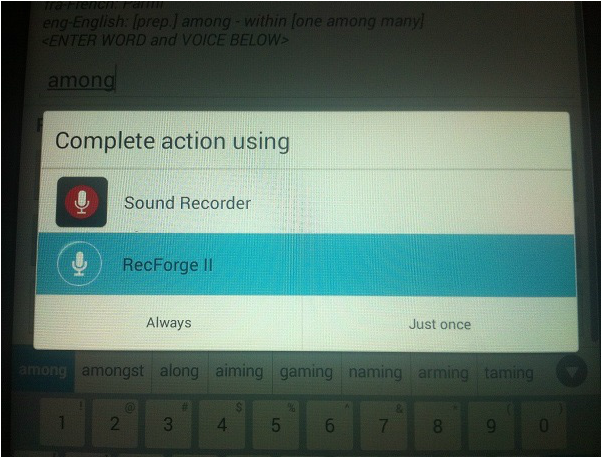 It is necessary with most Android phones that you install the free voice recorder called RecForge 2. You can find it on Google Play. 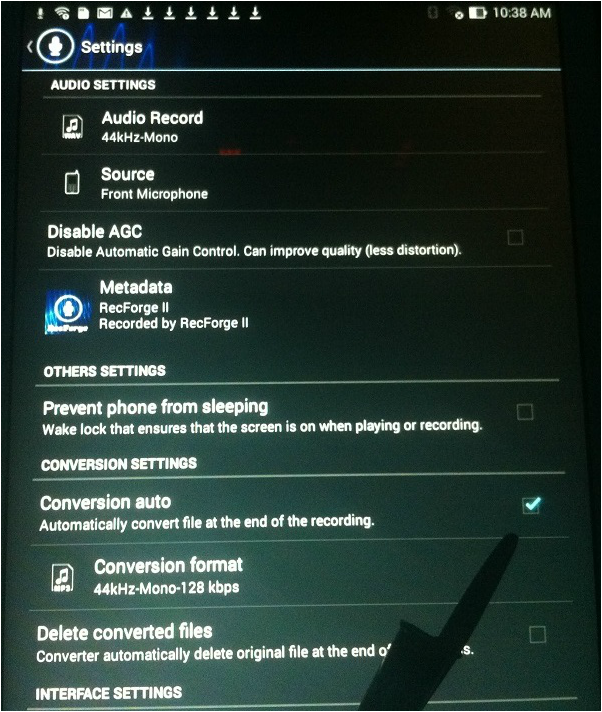 Set RecForge 2 to automatically convert to mp3 and it will use less space to save your high quality voice files. Press this button to go to RecForge 2 settings. Put a check here to make ReecForge 2 save your voice recording to 44kHz-mono128 Kbps high quality mp3 recording with less space. 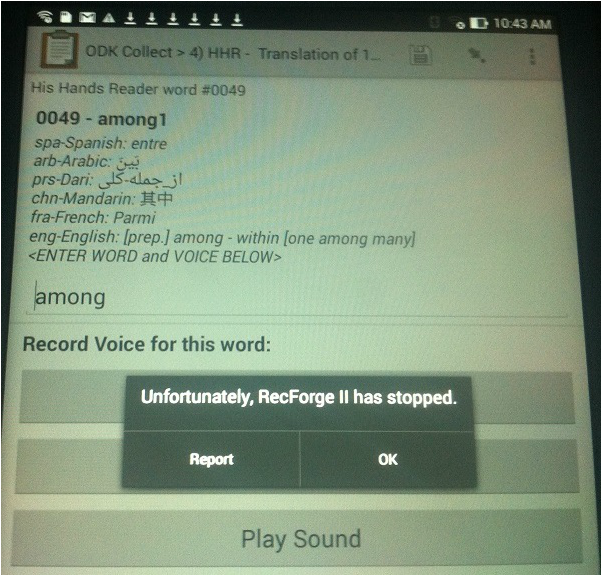 If you get an error like this when recording a word... Then your phone may not be powerful enough to convert the voice files to mp3 format. That's OK... Just uncheck the box for automatic mp3 conversion... and that should stop this error from occurring. 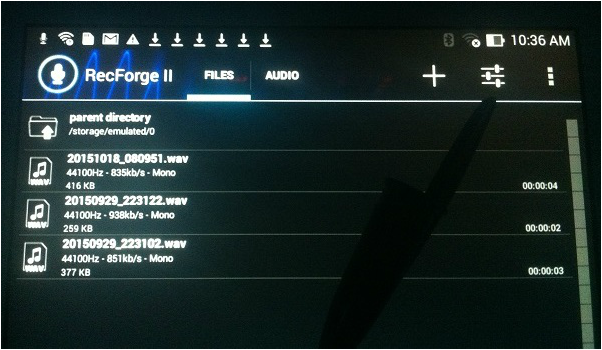 It just means that you will use more space to save your voice files. Press this button to start recording the word(s). 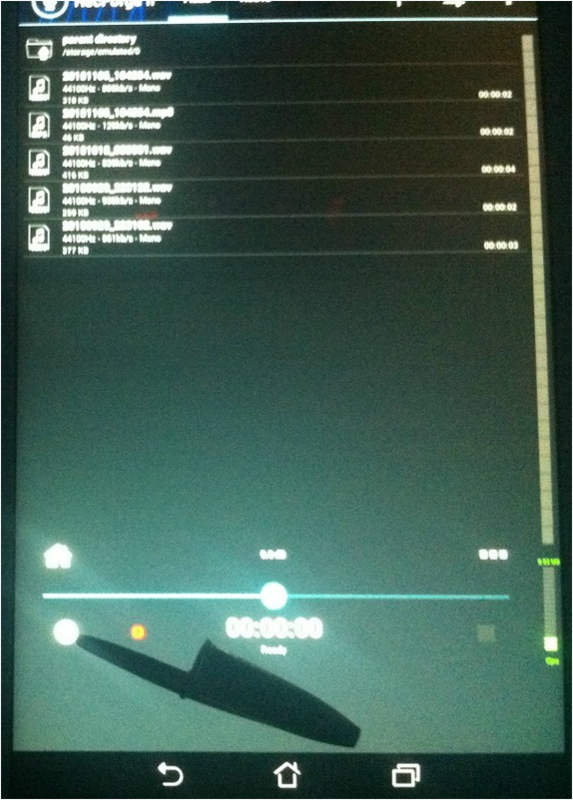 And press the square button to stop recording. 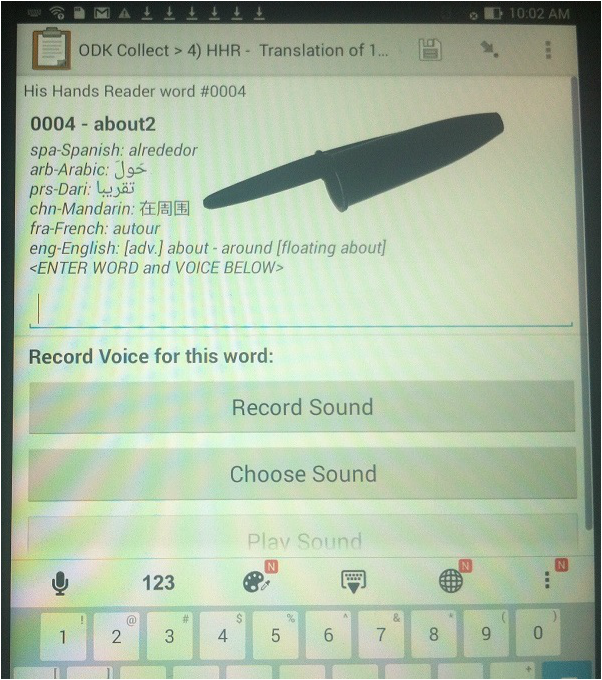 The "Play Sound" button will turn on if you have already recorded this word. It is OK to record again if you need to. It will replace that voice file. Press the save button every few minutes as well as when you stop work. 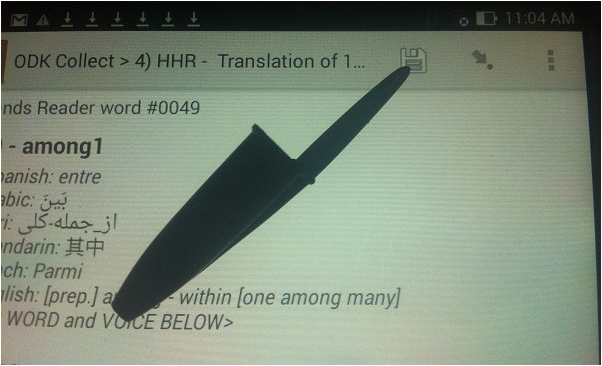 Each time you record your voice the mp3 file is saved but the pointer to that file from the form and the words you add to the form are only saved using this button. Press this button to go to the List view of the form.. the list view helps to quickly move through the 1742 words to the word you want to edit if you exit the form and want to open it again to start where you left off. 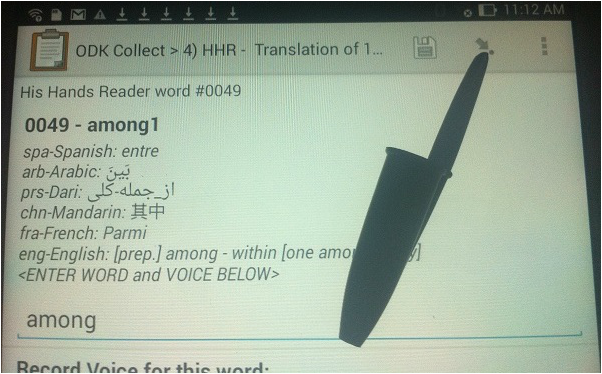 In this example I scrolled down the list until I see the last word that has a text word "among" and a recorded .wav file. I will select 0050-amount1 and open to that world to continue my work. 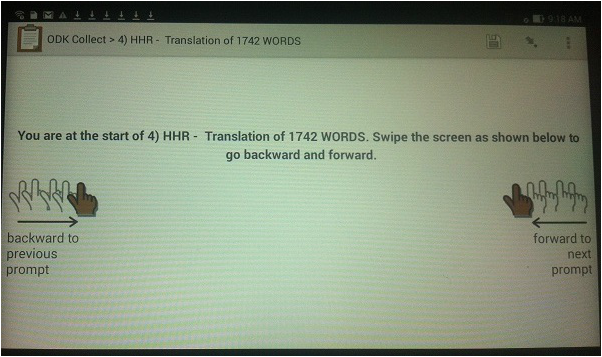 Once In the word view you can easily move to the next word by dragging the screen to the left. You only need to use the list view if you totally save and close the form. Then use the list view to quickly move to where you left off. 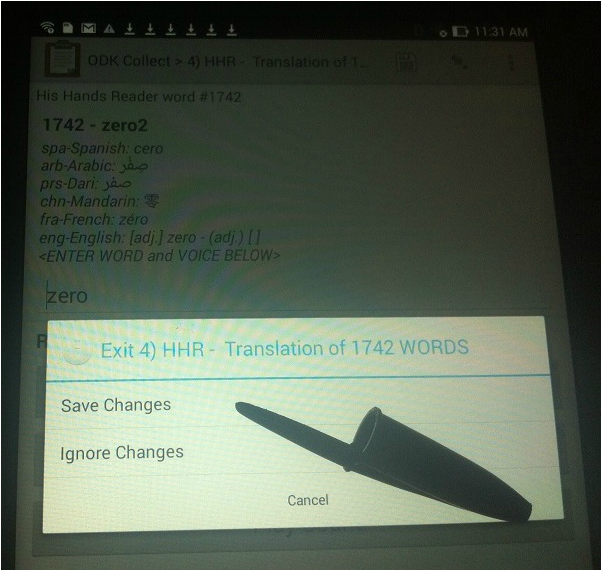 When you have finished adding and recording your words... you can exit the form by pressing the Back button. 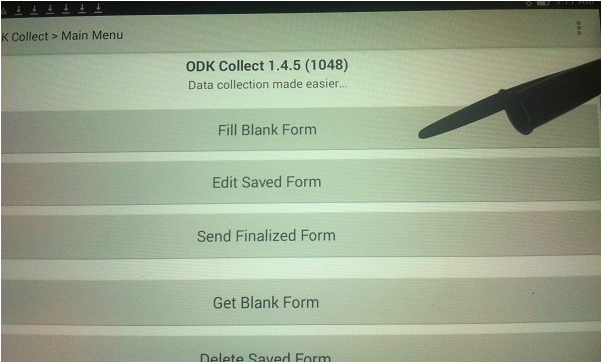 Whenever you Exit the form you are working on and need to open it again it is now located under the Edit Saved Form(#) button. Do not open a new form again as that will add another saved form and you will get confused as to which one you are working on! 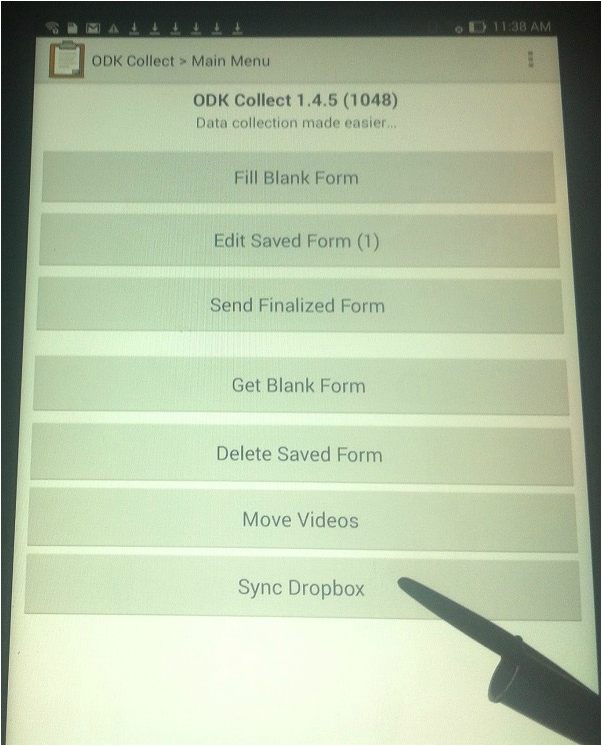 When you are in a wifi area you can press the Sync Dropbox button and your saved form and all voice files will be copied to your Dropbox account that you have set up on your Android. If you cannot finish the upload... don't worry. The next time you have wifi you can press the button again and it will finish copying the files that have not yet been copied. 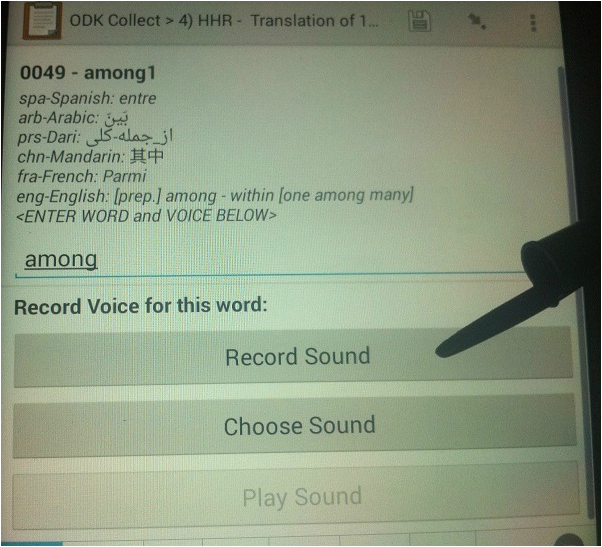 After you have entered and recorded your first few words... login to your Dropbox account and share the 'abc'-language folder with me BobAchgill@hotmail.com This way I will see your data as soon as you sync it to Dropbox. I can make suggestions if I see any issues with quality. 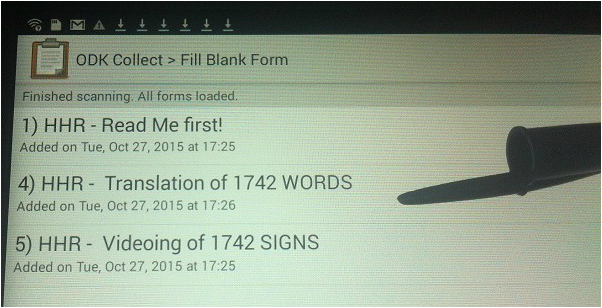 Send me an email to say that you are finished adding your words and voice recordings. 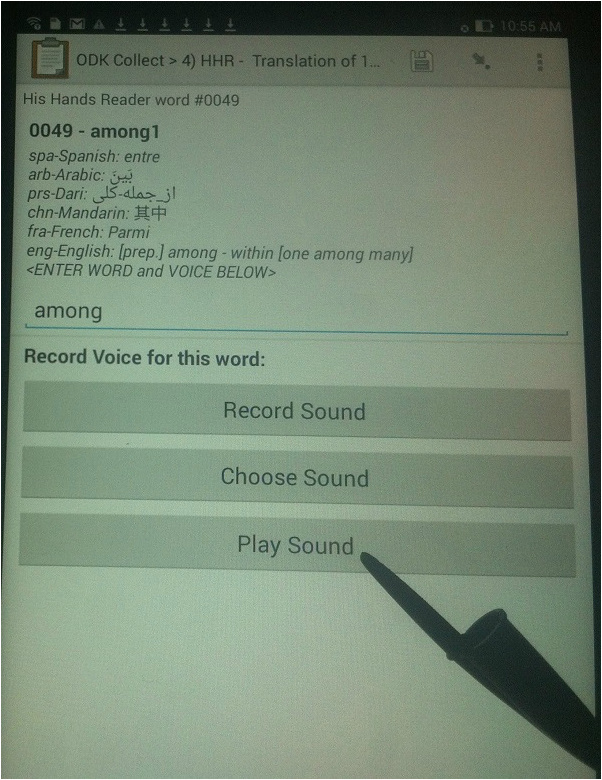 BobAchgill@hotmail.com And I will know that I can begin to make His Hands Reader videos using your mother tongue!